David Cameron says there will be an "authoritative" inquiry, led by a judge, to settle once and for all whether MI5 and MI6 were complicit in the torture of terror suspects. The inquiry is intended to resolve this vexed question, which, the prime minister said, had "overshadowed" the reputation of the security services for the past few years. I can think of really only two occasions in the past 30 years when the authorities have allowed the failings and misdemeanours of the British intelligence services to be held up to the public light - warts and all. In 1979, Margaret Thatcher stunned Parliament with her statement that the Queen's art curator, Sir Anthony Blunt, had been an MI5 traitor, spying for the Soviet Union. In 2004, the former cabinet secretary, Lord Butler, gave MI6 little quarter in his review of the "accuracy" of intelligence on weapons of mass destruction. In the year before the Iraq war, he concluded that two thirds of MI6's intelligence in Iraq had been coming from just two main sources. The latest inquiry will be chaired by former Appeal Court judge Sir Peter Gibson, the Intelligence Services Commissioner. An odd choice, perhaps, for an inquiry deemed to be fully independent. For the past several years it has been Sir Peter's job to report to No 10 on any rules or regulations that the intelligence services may have broken. Observers will be paying close attention to Sir Peter's approach to this inquiry in light of the controversy that stemmed from his review of key elements of the 1998 Omagh bombings. To command widespread public confidence in the inquiry, Sir Peter may have to dig deeper than he appears to have done when he was last tasked by a prime minister to investigate a sensitive intelligence matter. In 2008, Gordon Brown appointed Sir Peter to review what telephone intercepts were available to intelligence and security agencies in relation to the Real IRA bomb attack in which 29 people were killed and hundreds maimed and injured. The move to appoint Sir Peter was in response to a Panorama programme that revealed that GCHQ, effectively the government's eavesdropping agency, had monitored the mobiles of some of the bombers during the actual bomb run to Omagh. Yet neither the intercepts, nor even the telephone numbers of the mobiles were ever disclosed to the CID detectives trying to identify the bombers afterwards. Detectives have said that had the telephone numbers and names of the subscribers been passed to them, they could have provided an early paper trail and that some of the bombers might today be in jail. As it stands, no-one has been convicted of the worst single atrocity of the Troubles. Sir Peter's report, published in January 2009, angered relatives of Omagh's victims and survivors when it focused only on whether the Omagh bombing could have been stopped. He concluded it could not have been. On the one hand, Sir Peter told MPs it was "not up to GCHQ" what intelligence derived from GCHQ monitoring should have been shared by Special Branch with the CID. On the other hand, in the non-classified published version of his report he stressed that "strict conditions" were "imposed by GCHQ" about dissemination. In its own report, NIAC mainly blamed No 10 for the lack of clarity in his report by giving him what turned out to be narrow terms of reference, even though when published they had appeared to cover all the key bases. But NIAC's report also contained a note of frustration about the narrow approach taken by Sir Peter. It said: "It is unclear to us precisely what Sir Peter Gibson did investigate" and concluded that "far too many questions remain unanswered". In this latest inquiry, Sir Peter will be accompanied by two independent panelists - Dame Janet Paraskeva, the head of the civil service commissioners, and Peter Riddell, until recently, the distinguished Times political commentator, now a senior fellow at the Institute for Government. Observers will be likely to take some assurance from the panel's make-up that when the report of this inquiry is published there will be answers to all the key questions - whatever those answers turn out to be. 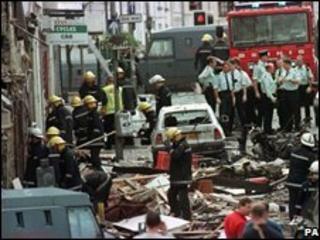 John Ware is a reporter for BBC Panorama who has reported extensively on the Omagh bombing.